Hibs boss Alan Stubbs has claimed tonight’s Scottish Cup derby with Hearts would have been a 20,000 sell-out even if the fifth-round replay was being shown live on television. And he admitted it was “a shame” that a nationwide audience will not be treated to a repeat of the original tie at Tynecastle, when his players came from two goals down to claim a 2-2 draw. News that UEFA rules prohibited matches elsewhere in Europe being screened live in opposition to Champions League games prompted a scramble for tickets, Hibs’ final wave of 1000 selling in less than 90 minutes yesterday morning. Head coach Stubbs said: “Even if it was on telly, I still think it would be a sell-out. It’s a shame people all over the country will not be able to see it, but the ones in the ground will, hopefully, see a spectacle. “It’s great that on a Tuesday night, when times are not easy, you have people rushing home from work and come 7.45 there will be more than 20,000 in the stadium. People talked about the crowd not being great on a Tuesday night, but it’s an Edinburgh derby and you have that crowd. “That’s fantastic, but it does not surprise me one bit with the fans we have. We will have 16,000 plus fans from our point-of-view and 3500 from Hearts. It has the makings of a great spectacle.” The bookies have installed Hibs as favourites to go through to a quarter-final at home to Inverness Caley, despite their Championship status. But while observing that profession rarely get it wrong and that there are few “skint” bookies to be seen, Stubbs insisted: “If anything, the reason why we might be slight favourites is because we’re at home. 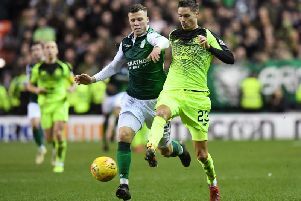 Stubbs accepted that supporters of both clubs will anticipate both him and Hearts boss Robbie Neilson to try to out-fox each other in a bid to gain an advantage, admitting: “Robbie may slightly do things differently, we may slightly do things differently. We’ve both had a look at each other and when that happens sometimes it can change the way you do things slightly. However, Stubbs insisted he was happy with his team’s display in Gorgie saying: “Even though we were 2-0 down, I didn’t ever feel as if we were dead and buried.